For the more adventurous the Southgate sand dunes will test all 4WD enthusiasts, if kite surfing or surfing is your thing then Geraldton's best surf beach (Backbeach) is just 5 minutes away. We flew to Arbolhos Island day tour and needed two nights accommodations. House was comfortable and fairly well equipped. It could have used a few more conveniently located electrical outlets for charging laptop, cameras, mobile phone, the kitchen appliances, etc. Wi-Fi would have also been a plus. The proximity to Brand Highway generated quite a bit of traffic noise. Overall, for the short time we spent at the house, these were relatively minor problems. Milk and welcome chocolates were a nice touch! Matthew and Nicole were responsive when we contacted them. The property was very easy to find. The back yard and pool were clean and very nicely appointed. Nice bar-b-que grille on the covered patio. Overall a very satisfactory stay. Beautifully presented home with an awesome outdoor area. 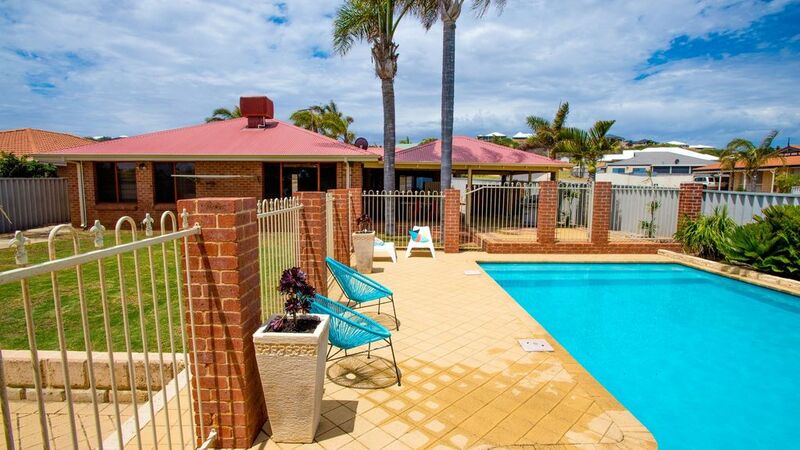 Extremely clean and well presented home, outdoor area is the star of the property, the pool is beautiful and was one of the main reasons we booked to stay here. Nothing to fault at this property, plenty of room for the kids and we always enjoy our time staying here. The property was clean and well equipped for our short stay. We were unfortunate with the weather but I still dared the pool which is an asset and would be truly wonderful on sunny summer days. The bed was comfortable, the bathroom clean and the whole place looked well maintained and well presented. Dropping one star because the sofa has seen better days and was not comfortable but this could easily be fixed. There is some noise from the nearby road that might bother some who choose to stay but for us it never became loud enough to cause annoyance. I would not hesitate in recommending the property and would not be at all surprised if we stayed again next time we are in the area. House was modern, very clean and well maintained. Perfect for families with young kids. Would love to be able to come back especially when its warmer to be able to get full use of the outdoor bbq and pool. Highly recommended. Thank you Graeme for taking the time to review our property, we really appreciate your kind words and look forward to you visiting again. We had a wonderful time , thank you so much . The house,pool and games room was fantastic . The kids just loved all the extra’s provided to keep them busy. It’s definitely one of the cleanest places we’ve ever stayed in, attention to detail was outstanding The only down side for us was the traffic noise, not something we are use too so we did notice it. Thank you Nicole and Matthew for allowing us to have such a fantastic family holiday. So glad your family enjoyed your stay and that the kids were able to make the most of the pool. Thank you for also leaving our home just the way you found it, we really did appreciate it. You are welcome back any-time. We stayed at the property for 12 nights whilst visiting family in the area. We were delighted with the property, There was everything there that you could need whether a couple or family. Lots of games, toys and dvds , table tennis and loads of inflatables for the pool. The milk, water, chocolates, tea and coffee was very welcome and saved us finding a shop on the first evening we were there, nice touch. The pool was the highlight of our stay, used it everyday to cool off in the 30+ degree temperatures. The pool was spotlessly clean, as was the house. We will definitely be rebooking this property when we are back in the area visiting our family.